Independence Day is a great holiday to celebrate with a patriotic, flag-waving parade. Be sure to wear your patriotic clothing and show your American spirit. In the Washington, D.C. area, you can join the crowds at the main event on the National Mall or attend a smaller community celebration. Here is a guide to the 4th of July parades around the region in 2018. 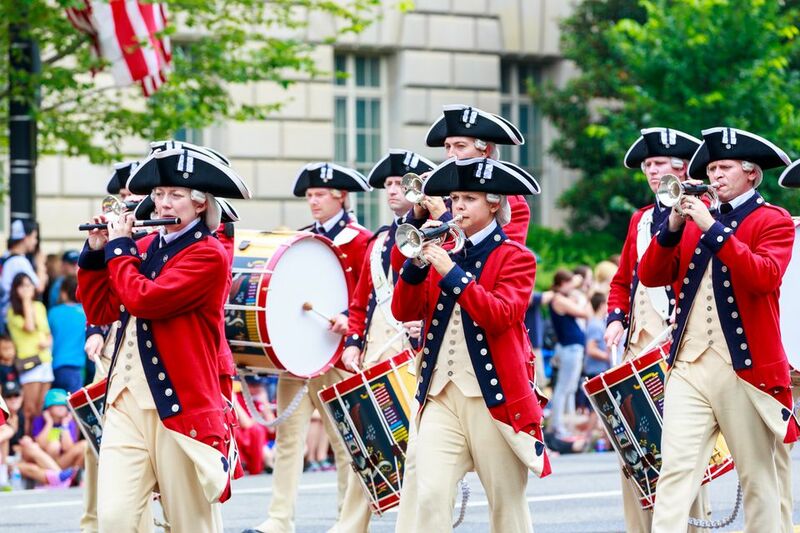 National Independence Day Parade: The parade begins at 11:45 a.m. (ends around 2 p.m.) and follows Constitution Avenue between 7th and 17th Streets. The parade features marching bands, military and specialty units, floats, and VIPs. The event kicks off a full day of spectacular Independence Day celebrations on the National Mall. Capitol Hill: Beginning at 10 a.m. at 8th and I SE, this lineup includes antique cars, community leaders, miniature superheroes and princesses, local schools, street performers, and more. Palisades: The parade begins at 11 a.m. at the corner of Whitehaven Parkway and MacArthur Boulevard and ending at the entrance to the Palisades Recreation Center. There is a free picnic afterwards with moon bounces, food, and live music. Takoma Park: The Takoma Park community celebrates the 4th of July with a full day of events including an Independence Day Parade beginning at 10 a.m., musical entertainment, and a spectacular fireworks display. The parade kicks off at Carroll and Ethan Allen Avenues, proceeds south along Carroll Avenue to Maple Avenue, then turns right on Maple Avenue and ends at Sherman Avenue. Kensington: This parade begins at 10 a.m. at St. Paul Park. The community celebrates the 4th of July with a Children's Bike Parade featuring bikes, stroller, wagons, dogs, and more. Montgomery Village: The 4th of July Parade begins at 10 a.m. at Apple Ridge Road and the Apple Ridge Recreation Area. A 5K Fun Run kicks off the holiday celebration at 7 a.m. Food, games, and entertainment run from 11 a.m. to 2 p.m.
Laurel: Beginning at 11 a.m. on 4th Street, Laurel, Maryland celebrates with a full day of entertainment including a patriotic Independence Day parade, an antique car show, contests, live music, and a fireworks display. Annapolis: An evening 4th of July Parade at 6:30 p.m. precedes the fireworks at the barge in Annapolis Harbor. The parade begins on Amos Garrett Blvd., and then proceeds right on West Street, around Church Circle, down Main Street, left on Randall Street, and ends in front of the Market House. Fairfax: From 10 a.m. to 12 p.m., the community comes together for a patriotic celebration beginning with a parade, followed by the Old-Fashioned Fireman's Day with firefighter competitions, food, and games and ending with a fireworks display. Great Falls: The 4th of July parade starts at the Village Green at 10 a.m. and ends at Safeway. The Great Falls Foundation sponsors a full day Hometown Celebration with a 5K Fun Run at 8 a.m., a blood drive, a Baby Parade at 9 a.m., festivities and food from 10:30-12:30 p.m. Then, there are evening games and activities at 6 p.m. and fireworks after dusk. Leesburg: The 4th of July parade begins at 10 a.m. at Ida Lee Park and travels down King Street to Fairfax Street. The community kicks off the holiday with a patriotic celebration through historic downtown Leesburg. Fireworks are scheduled for 9:30 p.m.